It's the biggest wedding of the century - Romeo & Juliet are getting hitched. And everyone is invited, everyone except Rumple & Goldilocks. In a drastic move, a disgruntled Rumple casts a spell (using Harry Potter's wand) to turn back time - hoping he and Goldilocks can change the present. Unfortunately, the spell backfires and creates even more problems. With midnight fast approaching and an outbreak of Minions on the loose - can Rumple restore things back to normal before they change forever? Once Upon a Taimi reminds us that everyone has a story, and every story has its place. 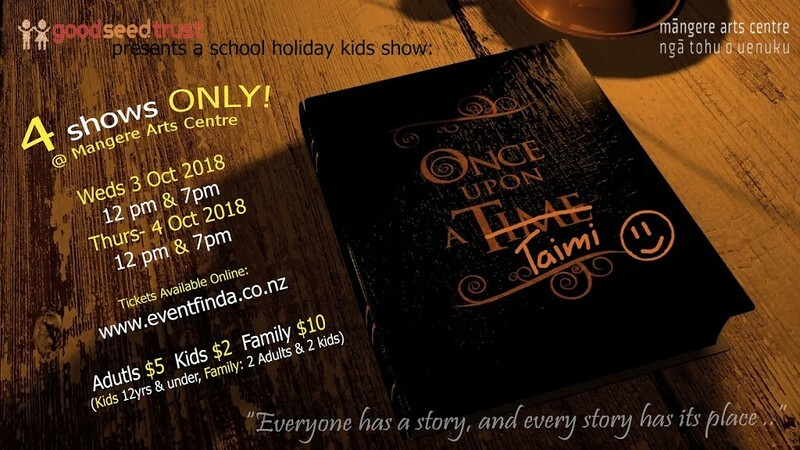 This is Good Seed Trust's fourth kids show - full of laughs, music and every fairytale character you've probably read about.